This box contains 12 Zombivor versions of the 12 survivors included in the Zombicide Season 3: Rue Morgue base set. It also includes 6 spawn cards and the rules to spawn zombivors on the board as The Lost. 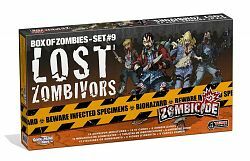 Any Zombivor figure that is out of play can be used to represent a Lost. In that role they are considered Zombies for all game purposes. They have a single action per activation and share the same place in the targeting priority list as Survivors (choose your targets among them). When a "Lost" spawn card is drawn, choose any Zombivor figure to spawn, they all behave the same way. All the standard spawning mechanics are used, except that a drawn "Lost" card is not placed in the discard pile, but removed from the game. A Lost suffers damage a little differently from normal Zombies. It requires 5 Wounds to be eliminated, suffering 1 Wound per Damage inflicted. So a Damage 2 weapon inflicts 2 Wounds, and so on. These Wounds accumulate until the Lost is eliminated. Killing a Lost not only grants you 1 Experience Point, but you also get to loot his corpse and take any weapon you'd like from the Equipment deck!